The preseason-long wait is finally over. The two-time defending NFC champion Seattle Seahawks begin their journey for a third straight Super Bowl appearance on Sunday when they take on their NFC West rivals, the St. Louis Rams. In their meeting in St. Louis last season, the Seahawks came close to completing a massive comeback. Unfortunately some Rams trickery and possibly some help from the officials was enough to doom the Seahawks as they lost 28-26. No matter how good or bad the Rams are, they ALWAYS play Seattle tough at the Edward Jones Dome. Since the Seahawks and Rams became rivals in 2002, Seattle has beaten St. Louis by more than one score only twice at the dome. Given that this is the first game of the season, this will be a much more evenly matched game than you may think. Here is what I will be looking for this week. It may be only week one, but believe it or not this may be the toughest road test the Seahawks will face all season. It is crucial that our offense does not struggle. This week on offense I am looking for the Seahawks to break from their traditional offensive approach. What I mean is this. The Seahawks tend to formulate a game plan and for the first half they stick to their blueprint no matter what happens. This sometimes means the Seahawks struggle, fall behind, then in the second half they adapt to what the opposing defense is doing and in the process call plays that will take advantage of the defense’s weaknesses, thus moving the ball and scoring points. I would not be surprised at all if the Seahawks try to establish the running game early and struggle, allowing the Rams to control the momentum early. I believe stretch runs, screens, and quick slants are the best plays to call for the Seahawks to thrive this week due to the uncertainty of our offensive line play against the Rams superior front seven. Given this, Tyler Lockett could make a big impact out of the slot this week. If the offense can put at least two touchdowns on the board and Marshawn Lynch can run for at least 70 yards, Seattle will be in fantastic shape. It should be obvious what my defensive focus is on this week. Half of our Legion of Boom starters have turned over from last year. Strong safety Kam Chancellor continues his holdout, which means that Dion Bailey will start in his place. Cary Williams will start at cornerback opposite of Richard Sherman. If Rams quarterback Nick Foles gets good protection I expect him to challenge our secondary early. It also would not surprise me if the Seahawks play a good amount of nickel coverage with Marcus Burley this week to take away the potential speed threat of Tavon Austin and Stedman Bailey in the slot. The St. Louis Rams enter this week’s game somewhat of a mystery on offense. They are led by a new quarterback, Nick Foles, who was acquired in a trade with Philadelphia over the offseason. Running back Tre Mason is questionable this week and rookie Todd Gurley will be inactive as he is still rehabbing from a torn ACL he sustained while at the University of Georgia last year. At this point it is looking like Benny Cunningham will start at running back. To make things even murkier, St. Louis will start two rookies along the offensive line. For the first time ever I am putting my X-Factor Players to Watch spotlight on these rookie linemen, left guard Jamon Brown and right tackle Rob Havenstein. Brown will have to deal with Brandon Mebane in the A gap while Havenstein will have his hands full with Michael Bennett on the outside. If Bennett can penetrate the line of scrimmage with ease the Rams could be in big trouble throughout the game. Short passes may be the best strategy for the Rams given the questions in pass protection and because of how poorly the Seahawks defended quick passes during the preseason, especially on third down. I believe Foles will look to his bigger receivers Kenny Britt and Brian Quick on the outside. Keep an eye on Quick in particular, as he will likely line up against Cary Williams. If there is one thing the Seahawks should have learned in these games in St. Louis is to be on the lookout for special teams funny business. In 2012 the Rams successfully executed a fake field goal for a touchdown and the Seahawks lost by 6. Last season the Rams conducted a fake punt to perfection, baiting all the Seahawks special teamers to one side of the field with a decoy returner while Stedman Bailey fielded the punt on the other side of the field and ran straight down the sideline for an easy touchdown. Then late in the fourth quarter, punter Johnny Hekker lined up to punt but threw the ball for a first down, extending the Rams final drive. 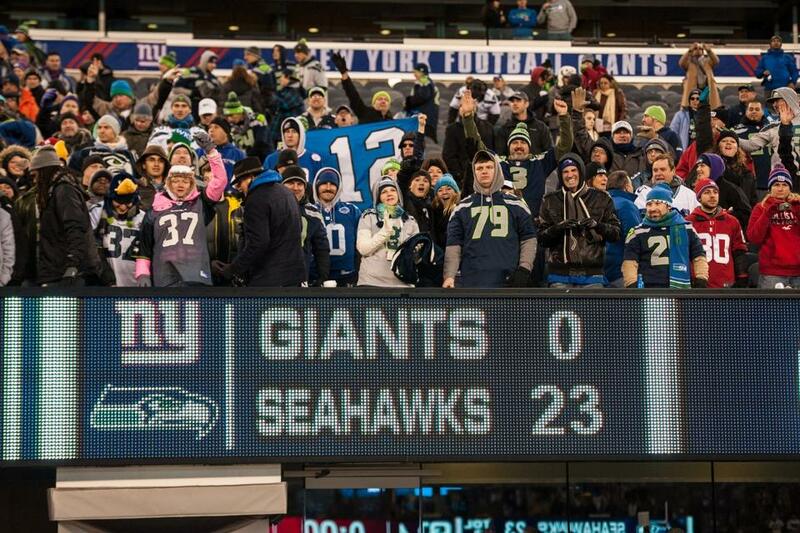 The Seahawks, as you know, lost by 2. I believe everything is fair game on special teams in this game. I believe three fake-outs in three years is enough for Pete Carroll and the coaching staff to finally put a heavy emphasis on trick plays in practice this week. The Seahawks will surely be on alert. I dare the Rams to try to catch us off guard on special teams. 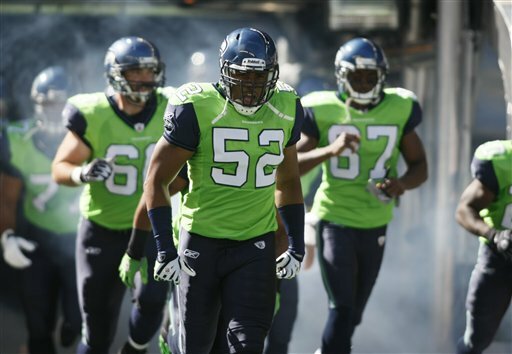 Random Thoughts: The Seahawks are finally telling the fans in advance what their uniform combo will be. We will be wearing white jerseys and college navy pants this week. Hopefully the Seahawks will give this kind of notice every week this season… The Rams will wear navy jerseys. My guess is they will wear navy pants with them… Kenny Albert and Daryl “Moose” Johnston have the call for FOX this week… The referee this week is Jeff Triplette. Since Bill Leavy has a new role with the NFL, I now believe Triplette is the worst referee in the league. Don’t be surprised to see many questionable and/or wrong calls this week… It will be nice to have a bunch of friends over for football this week. Barbeque and Bud Light all day long!… The Rams are yet another team threatening to relocate to Los Angeles next season and they may be in most dire need for hometown support. The Rams are struggling to fill seats at the Edward Jones Dome for this game and it wouldn’t surprise me to see the majority of the upper deck empty. Given the excitement around St. Louis for the Cardinals success and the fact that they play at the exact same time as the Rams on Sunday, support for the Rams will be visibly lacking, perhaps virtually nonexistent at the dome. Personally I would love to see the Rams move to Los Angeles because the NFL would kill two birds with one stone. The Rams moving to LA would mean that the NFL wouldn’t have to worry about division realignment (something that would have to occur if the Chargers and Raiders both moved to Los Angeles). In my mind a Rams move would also create a geographically perfect NFC West with teams in Seattle, San Francisco, Arizona, and Los Angeles. Prediction: I expect rust. I expect penalties. What I do not expect is for the Seahawks to lie down. Marshawn Lynch will catch a touchdown out of the backfield in the red zone and Jermaine Kearse will add a deep touchdown of his own. Steven Hauschka will miss one extra point but will redeem himself in the fourth quarter with a 48-yard field goal. The game will come down to a 57-yard field goal attempt off the foot of Rams kicker Greg Zuerlein, which he will hook wide right. The Seahawks will survive and start the season 1-0 for the third straight season. Over the past few years the Seattle Seahawks have played games on the road where the defense could not get off the field on third down. Never had I seen those kinds of defensive failures in a game played at CenturyLink Field. 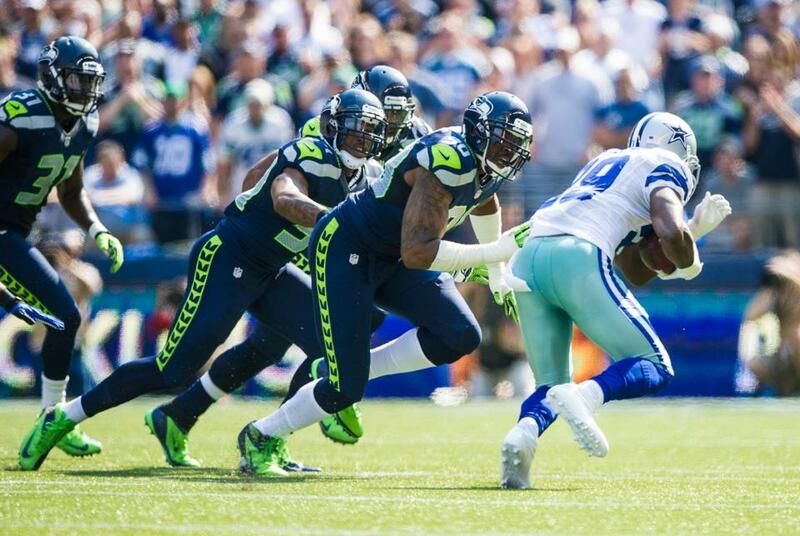 The Seahawks lost only their second home game since 2011 on Sunday, falling to the Dallas Cowboys 30-23. While the Cowboys maintain a share of the NFC East lead with a 5-1 record, the Seahawks are now 3-2 and by the end of Monday night’s game they could be sitting in 3rd place in the NFC West. The Seahawks struggled mightily in multiple aspects of this game while still being able to score 23 points. Here is what I took out of Sunday’s game. Offensive Talking Points: There are few positive notes this week on offense. Russell Wilson played a very safe game, throwing for only 126 yards and one interception. Wilson also added the Seahawks only offensive touchdown of the game, scrambling for 9 yards to tie the game at 17-17 at the start of the third quarter. Jermaine Kearse led all receivers with 3 catches for 62 yards but Wilson had a difficult time connecting with his receivers, leaving the pocket to try to create space for the majority of the game. 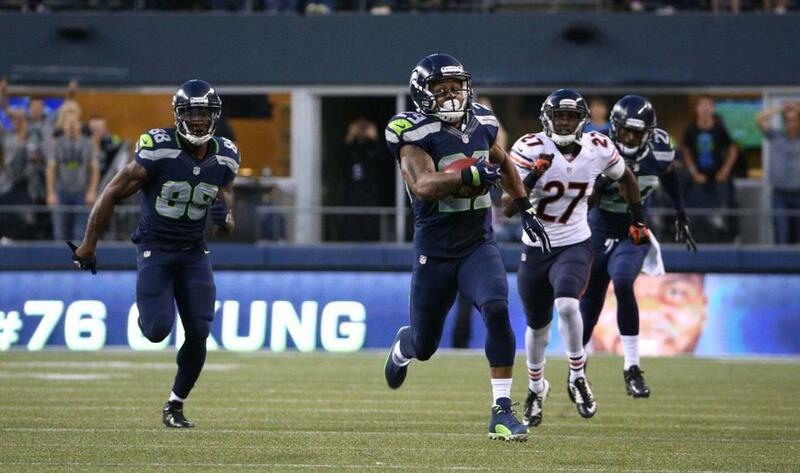 One major disappointment was the ineffectiveness of the running game and Marshawn Lynch. Feeding the beast is more often than not the reason why the Seattle offense is so successful, so to see Lynch with a stat line consisting of only 10 carries for 61 yards, it is frustrating. If you take away Lynch’s 32-yard scamper, he ran the ball for an average of only 3.2 yards per carry. Looking ahead to next week is scary, as the Seahawks and Lynch will face a front-7 even better next week when they take on St. Louis. What Did I Say About the Dallas Special Teams? : In my preview post I noted how the Dallas Cowboys always make a crucial mistake on special teams that costs them points when playing in Seattle. Sunday was no different as Doug Baldwin blocked a Chris Jones punt and Mike Morgan returned it 25 yards for a touchdown to give the Seahawks a 10-0 lead. At that point it looked like the Seahawks were going to run away with this game and it is shocking that we could have that much momentum and lose it the way we did. The Seahawks also recovered a Dwayne Harris muffed punt which led to a touchdown in the third quarter. My hope is that the Seahawks can expose future opponents on punt formations as well as they did on Sunday, as it could pay dividends later on in the season and could also lead to scoring opportunities. Cowboys Offensive Line Better Than Advertised: DeMarco Murray and the Cowboys running game was very hard to stop throughout the game, thanks in large part to the play of the Dallas offensive line. The line paved the way for 162 total rushing yards and a Murray touchdown in the fourth quarter. The line also did a magnificent job of protecting Tony Romo as he was only sacked once. In the trenches it was Dallas that bullied the Seahawks defensive line throughout the game and at the end of the day the leading tackler along the Seattle defensive line was Tony McDaniel with 4. What scares me about the Cowboys success in the running game today is that it gives future Seahawks opponents a game’s worth of film as a blueprint to designing a game plan to run the ball just as effectively. Third Down Woes: The Seahawks simply could not get off the field on third down this week. The Cowboys converted 9 of their 15 third down attempts (60%) with 5 of them coming with 8 yards to go or more. The Seahawks could not get to Tony Romo as he had a comfortable pocket to throw out of for the entire game. Putting pressure on Romo would have been a sure-fire way to create turnovers and although the Seahawks won the turnover battle this week, the plays Dallas were able to convert ultimately cost us the game. The Play That Could Have Changed the Game: Among the many opportunities that slipped through the Seahawks fingers this week, one play literally slipped through the fingers of Byron Maxwell and it could have changed the entire outlook on the game. With the Cowboys facing a 2nd and goal in the first quarter Tony Romo fired a pass to the left side which was nearly intercepted by Maxwell. From my view Maxwell had 100 yards clearly in front of him and if he could have held onto the ball he would have returned it the length of the field for a touchdown, giving Seattle a 17-0 lead and the chances of us keeping our foot on the throat of the Dallas Cowboys would have been much greater. Instead Maxwell dropped the potential interception and Romo connected with Gavin Escobar for a touchdown on the very next play; a 14-point swing just like that. The Play that Did Change the Game: The Cowboys faced an improbable 3rd and 20 late in the fourth quarter. The Seahawks held a 23-20 lead at the time and a stop on this play would have forced Dallas to punt and the Seahawks would have had time to try for insurance points on their next drive. Instead, after escaping the wrap of Bruce Irvin, Romo found Terrance Williams for a toe-tapping 23-yard reception. The spectacular catch by Williams extended the Cowboys drive and DeMarco Murray was able to score later on in the drive to give the Cowboys a lead that they would hold onto for good. As great of a catch as it was by Williams, how in the world could the Seahawks secondary play so soft to even allow Williams to have a chance at making the catch?! Simply frustrating. Thoughts on Dallas: If they can keep up this dominant offensive pace, the Cowboys could be a very dangerous team going forward. The NFC East will come down to either Dallas or Philadelphia and barring injury I think the Cowboys are fully capable of winning the division. They know they can come into Seattle and win, so that makes Dallas a dangerous team if they make the playoffs as a wild-card team also. I do not think this team is capable of making a Super Bowl caliber run in the playoffs but they could certainly make January football interesting and intriguing. Random Thoughts: Seahawks in navy, Cowboys in white just as expected… 5 Bud Light’s in a bucket for $20 is the best pregame deal at the bars. Can’t beat that value… Don’t blame this game on the officiating. I still hold a grudge against Bill Leavy as most other Seahawks fans do as well but the Seahawks beat themselves on this day… The starting offense was introduced this week. Good to see Jermaine Kearse get the opportunity to run out of the tunnel individually for the first time in his career… There were no intriguing morning games this week with the Cardinals playing in the afternoon and the 49ers and Rams playing on Monday night… A lot of Seahawks fans bailed after we failed to score at the end of the game, even with one timeout and the two-minute warning left. Did the Broncos game not teach you anything about leaving the stadium early?? ?… There were a good number of Cowboys fans at the game this week so that was a little discouraging. I wonder how long it took the bandwagon to get here… I thought we would win this game, and when we did I thought we would be in good shape to split our next two games, both on the road. Now with this loss I think it is necessary for us to win both of our next two games. It will be tough but I think we can do it. 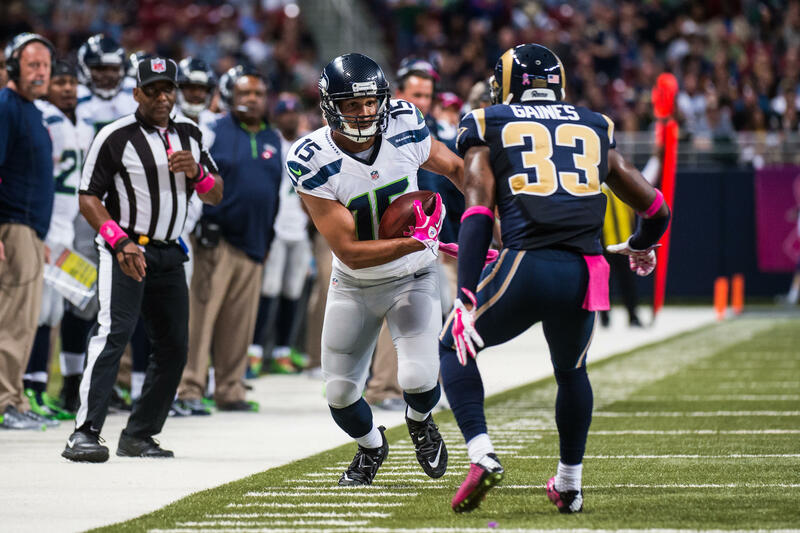 Check back on Saturday for a preview of the Seahawks week 7 matchup with the St. Louis Rams. Thanks for reading and Go Hawks! Who would have thought that going into week 6 the Dallas Cowboys would be 4-1? All of a sudden this week’s game has way more meaning than I originally thought it would. 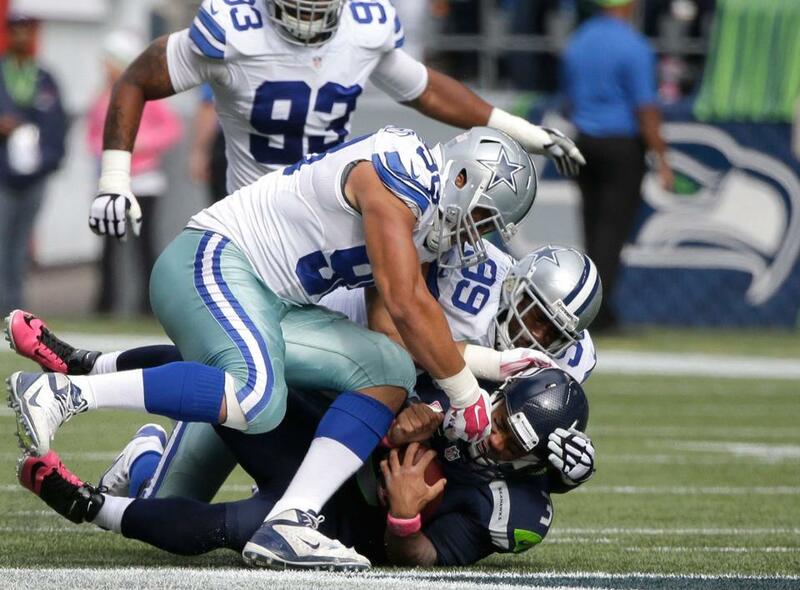 On Sunday afternoon the Dallas Cowboys come to Seattle to face the Seattle Seahawks. At 4-1 the Cowboys are tied for first place in the NFC East while the Seahawks sit at 3-1 and are tied for first place in the NFC West. Dallas leads the all-time series with the Seahawks 9-6 but in their last meeting in September 2012 Seattle handled the Cowboys easily, winning 27-7 with Russell Wilson earning his first NFL victory. Two seasons, 30 victories, and one Vince Lombardi trophy later, Wilson will attempt to tame Dallas once again. Here is what I am looking for in this week’s game. The Dallas Cowboys sport the NFL’s leading rusher, running back DeMarco Murray. Murray’s 134 yards per game average is the best in the league and the first priority of the Seahawks defense will be to stop him. Look for Kevin Williams and Jordan Hill to have an expanded role along the Seahawks defensive line this week along with starting defensive tackle Brandon Mebane. It will be on these three guys to plug holes to limit Murray’s production. It will be crucial to stop Murray on first and second downs to force quarterback Tony Romo to throw. Romo has had a history of making bad throws and turning the ball over in Seattle so it will be crucial for the Seahawks pass rushers to put extra pressure on to force Romo into mistakes. If the defense can do both of these things the Seahawks will be in excellent shape. Going into this season many believed that the 2014 Dallas Cowboys defense could statistically be one of the worst defenses in NFL history. Although they have not played terribly (yet), the Cowboys still rank in the bottom half in both pass defense and run defense. Dallas has given up an average of 122 rushing yards per game and if the Seahawks are successful running the ball much like they were last week this could be an easy win. On offense this week I believe the Seahawks will be victorious if Marshawn Lynch tops the 100 yard rushing plateau. Also keep an eye on Seattle’s use of the read option this week. Russell Wilson ran 14 read option plays against Washington last week and I think we will see more of it against a Cowboys team that has not faced a duel-threat quarterback since week 1 (Colin Kaepernick). I could see the Seahawks running between 5-10 read option plays. On these plays if Russell Wilson can run for 40-50 yards I believe we will be unbeatable. Expect to see Percy Harvin used just like he was last week, with expanded playing time lined up in the backfield. When it comes to the Dallas Cowboys on the offensive side of the ball everyone looks at DeMarco Murray and wide receiver Dez Bryant as the motor that makes the offense work. With the Seahawks primarily focusing on stopping Murray and with Richard Sherman likely covering Bryant, it would not surprise me to see Tony Romo throw to his other targets. Enter my “boom or bust” X-Factor player to watch, wide receiver Terrance Williams. I say Williams is “boom or bust” because he has been rather inconsistent on the stat line this season. On good days Williams can be dynamic, much like he has been the past two weeks when he caught a combined 8 passes for 148 yards and 3 touchdowns. In the first three weeks of the season however, Williams struggled, catching only 8 passes for a combined 102 yards, a 34 yards per game average. With Williams likely matched up against Byron Maxwell for the majority of this game, it would not be surprising to see Romo throw in Williams’s direction to try to pick on Maxwell. There is one pattern that I must address with the Dallas Cowboys coming to town this week. The Cowboys have played two meaningful games in Seattle since I became a season ticket holder in 2006. In both of these games the Cowboys have made at least one blunder on special teams. Everyone remembers the Tony Romo botched snap in the 2006 playoffs but many fans may not remember what happened the last time Dallas came to town. In our 2012 matchup Dallas kick returner Felix Jones fumbled the opening kickoff right into the arms of Earl Thomas. The Seahawks cashed in 7 plays later with a Steven Hauschka field goal. On the next Dallas possession, Bruce Irvin blocked a Chris Jones punt and Jeron Johnson returned it for a Seahawks touchdown. The Cowboys special teams have a rich history of struggling at CenturyLink Field so it will be interesting to see if the Seahawks can score any points on special teams this week. Random Thoughts: The Seahawks will wear navy blue this week with the Cowboys wearing their traditional white jerseys and metallic silver/blue pants… Thom Brennaman and Troy Aikman have the call for FOX this week. Brennaman will be paired with Aikman for the next three weeks while Joe Buck calls the National League Championship Series and World Series for FOX. Even though Brennaman will do the play-by-play, this will still be FOX’s “America’s Game of the Week” broadcasted to the majority of the country… Bill Leavy is this week’s referee. Now that the Seahawks have won a Super Bowl it wouldn’t surprise me if Leavy’s Seattle limitations have been lifted. For those of you who don’t know this will be only the third time Leavy has officiated a Seahawks game in Seattle since Super Bowl XL… This week we will have an extra 20 minutes before kickoff as the game starts at 1:25pm. Everyone be in their seats ready to go by kickoff!… October is breast cancer awareness month in the NFL and this week the giveaway is pink ribbon pins. I am also excited to show off my pink Strideline socks for the second time this season… I think I’m only going to bring the leftover streamers I didn’t use at the Broncos game. Don’t feel like going to buy more. I’ll have to stock back up fully for the Raiders game… If the Seahawks win this week we will be 4-1, the same record we had through our first 5 games last season. Prediction: A lot of people think the Cowboys can come into Seattle and make this a close game but I think otherwise. I think the Seahawks are primed for a decisive win. Marshawn Lynch will score two touchdowns and Michael Bennett will recover a Tony Romo fumble and take it to the house. The Seahawks will win this game to get to 4-1 and we will get ready for a huge test next week, our first division rivalry game of the season against St. Louis. Check back late Sunday night for my review of this game. Go Hawks! The Seahawks took the field Friday night against the Chicago Bears and looked as if they just picked up right where they left off last week against San Diego. The Seahawks, led in large part by their powerful starting offense, beat the Bears 34-6 improving their record to 2-1 on the preseason. The Seahawks conclude the home portion of the preseason defeating their opponents by a combined score of 75-20 and after the game Head Coach Pete Carroll made it be known that the Seahawks “are as ready as I can get them.” With the first round of roster cuts coming up next, let’s take a look at the positives I took from this game. Wilson is Ready for the Regular Season: With quarterback Russell Wilson at the helm, the Seahawks got off to a red-hot start and by the time Wilson exited the game in the third quarter the Seahawks had built a very comfortable 31-0 lead. 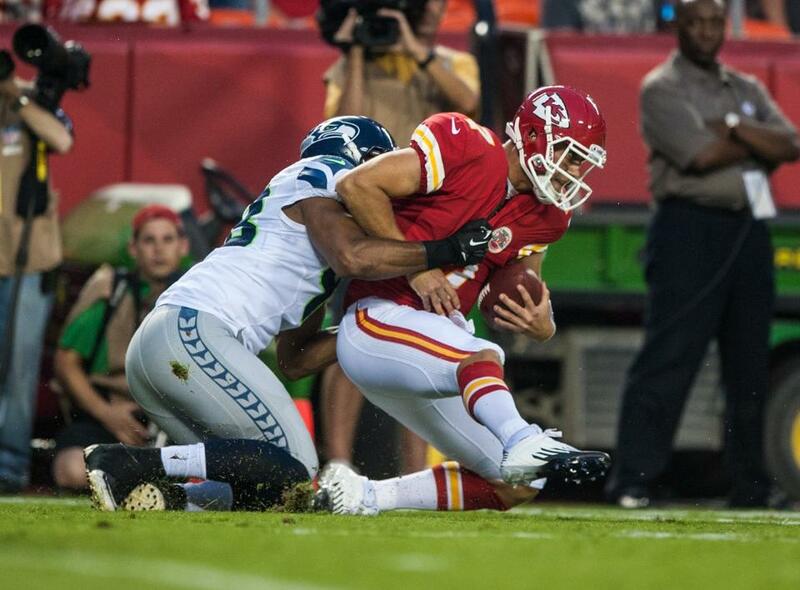 After a strong performance last week, Wilson outdid himself this week going 15/20 for 202 yards and 2 touchdowns. Wilson added 23 yards and a touchdown on the ground as well. Throughout the first half Wilson stayed poised as he kept plays alive and made accurate throws. The offensive line also did a very nice job keeping Wilson upright as he was only sacked once and for the most part, Wilson was able to stand in the pocket comfortably. Russell Wilson looked to already be in mid-season form and his play over the past two weeks has gotten me even more excited about the potential effectiveness of our offense all season long. Lynch is Ready for the Regular Season: Marshawn Lynch played for only one series on Friday night but he too showed that he is ready for week 1. Lynch capped off a 7 play, 61 yard drive with a 7-yard touchdown run giving the Seahawks an early 7-0 lead. If you were to pick one player that does not necessarily need to play in the preseason, it is Lynch. However, seeing him carry the ball reaffirms my confidence as a fan that Lynch is ready for the regular season and does not need to be out on the field and risk getting hurt. He has perfected his craft and although it is nice to see him get some carries to perhaps shake the rust off, it is not at all necessary for him to play. Thomas Returning Punts? It Will Probably Happen: During mini-camp when Coach Carroll said that Earl Thomas was going to get the first opportunity to return punts, many fans scoffed at the idea; they didn’t want to see our All-Pro free safety get hurt in situations where the opponent is running full speed trying to take your head off. Three weeks into the preseason and it is looking more and more like Thomas will be our punt returner when the Seahawks play the Packers in two weeks. Thomas’s play on special teams Friday night greatly boosted his chances at getting the return job. Thomas returned two punts, one of which a 59-yard return in the closing minutes of the first half. Earl Thomas has the explosiveness that no other candidate for the punt return job has and I believe this one punt return against the Bears has earned him the job once the regular season starts. Having Thomas return punts is high risk/high reward in my eyes. The risk is the aforementioned risk of injury. The reward is explosive runs for large gains and great field position; something that will make it much easier for Russell Wilson to lead touchdown drives. Jackson vs. Pryor (Round 3): This competition should be over. In my opinion, one play on Friday night completely took Terrelle Pryor’s name out of contention to be Russell Wilson’s backup. With 5:06 remaining in the game, a Bears defender went unblocked on a blitz and Pryor threw up a duck that was easily intercepted by Bears cornerback C.J. Wilson. It was a terrible decision by Pryor to throw and that kind of decision making gives Tarvaris Jackson a significant leg up on Pryor to win the backup quarterback job. Coach Carroll constantly preaches that it is “all about the ball” and Pryor seemed to be inept in that moment. He could have taken the sack or throw the ball out of bounds for intentional grounding and the Seahawks would have been penalized but kept possession of the ball. Instead the ball was intercepted and the Bears took over on offense. It is now a question of whether Pryor will stay on as our 3rd quarterback or will he be cut before the regular season starts. He will have one last chance next week to prove he is worthy of a roster spot. If I were Pryor however, I would seriously be questioning my job security after a performance like the one he had against Chicago. Lane Shines: The defensive player of the game this week was without a doubt cornerback Jeremy Lane. Lane led all Seahawks defenders with 6 tackles including 3 passes defensed and a 41-yard interception return that cost the Bears a goal-to-go scoring opportunity. On one of his passes defensed he showed outstanding vertical ability, out jumping the receiver and nearly picking off his second pass of the game. Lane and fellow cornerback Tharold Simon have been battling to be the primary nickel corner and Lane has taken big step in securing that job. After an average first half of the preseason, Lane’s performance against the Bears fully re-assures my confidence that if Richard Sherman or Byron Maxell were to get hurt, the Seahawks and the Legion of Boom will be in good hands. Thoughts on Chicago: I have one point to make in regards to the Chicago Bears. 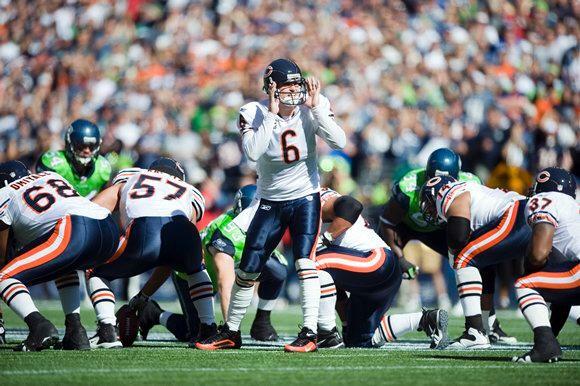 If Jay Cutler gets hurt, the Bears are screwed. With Cutler in the game on Friday night the Bears passed the ball 79% of the time. This will be a heavy passing offense and if Cutler goes down the Bears will have no choice but to have either Jordan Palmer or Jimmy Clausen lead this dominantly passing offensive unit. When completely healthy I believe this offense is good enough to stay competitive and win games. If any of the Bears skill position weapons (Cutler, Matt Forte, Brandon Marshall, Alshon Jeffery) go down, the Bears will be a very vulnerable team. Random Thoughts: I got the uniform combinations right once again. Navy/navy for the Seahawks, white/navy for the Bears… CenturyLink Field had two banners ready to be unveiled this week but they held off on both once again. All three of our 2013 banners will be unveiled before we play the Packers… Nice to see the majority of the crowd booed referee Bill Leavy at the beginning of the game, re-affirming that the majority of Seahawks fans have not put Super Bowl XL entirely behind them… The Seahawks are selling beer in souvenir cups that look like a total rip off. The cups look like they hold anywhere from 8-10 ounces of beer. In other words, they seem tiny. They cost the normal beer price though… Elysian Fields before the game once again this week. I Actually got to have a couple of beers. It was a fun and festive atmosphere, even more so than last week… If you are around downtown Seattle I highly recommend Chuck’s Hole-in-the-Wall BBQ on James Street. I made a second appearance there for lunch on Friday and the brisket/pulled pork/chicken combo platter did not disappoint… Not as many Bears fans in attendance as I thought there were going to be so that was nice… I understand the NFL bag policy but the fact that I could not bring in a sweatshirt I had bought earlier in the day which was in a white plastic bag is kind of ridiculous. It’s just a sweatshirt and it’s just a bag… If you walk through Pioneer Square you can see light post banners advertising NFL Kickoff 2014. I simply cannot wait for a week from Thursday. It is going to be a rocking party all day long! The Seahawks have until 1pm Tuesday to cut their roster from 90 players to 75 players. Check back later this weekend for a new post as I predict which 15 players will not be on the team when we play Oakland next week. Thanks for reading. Go Hawks!